Cities can dramatically improve street vendors’ livelihoods by providing sufficient space and infrastructure for vending. Photo by Prasanth Chandran/Flickr. As previously discussed on TheCityFix, informal street vendors in cities around the world experience daily challenges to their economic livelihoods. For example, street vendors are perceived to be detrimental to city life, unhygienic, noisy, and to obstruct smooth flow of commuters, pedestrians and traffic. In the minds of some policymakers, hawkers crowd sidewalks, plazas and parks, come too close on the subway, or sell too close to local businesses. Many of these complaints, however, are due to insufficient spaces and infrastructure for street vendors. These problems are more pronounced in dense cities like Mumbai or Hong Kong. 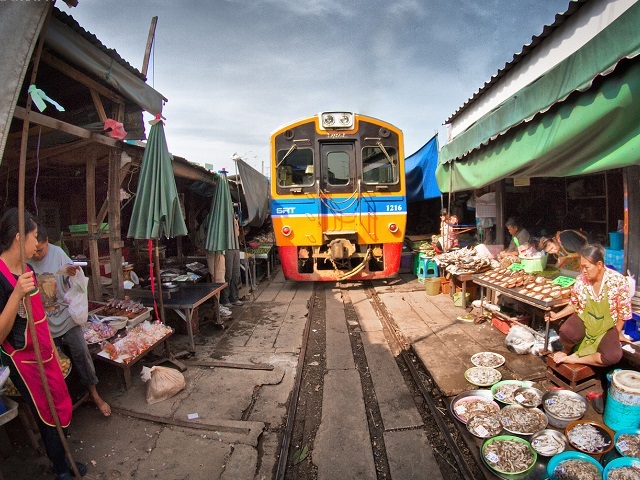 In Bangkok, for example, space is so limited that vendors set up a market on the train tracks, moving their carts and awnings four times a day as the train passes. However, several strategies can alleviate these concerns over space for street traders and provide them with better economic opportunities. These strategies include proper mapping, efficiently managing public spaces, and providing appropriate infrastructure to vendors. Any urban intervention that involves spatial changes depends on maps, yet most urban maps do not accurately account for street vendor populations. One potential mapping solution, called “community-led enumerations,” involves vendors or their representative organizations in the data collection process to form a more complete census. This method increases vendors’ trust in city government and the results of mapping efforts. In Mumbai, by contrast, the hawkers’ union perceived the city’s surveys as inaccurate and not properly verified. They claimed that new hawkers who had established stalls overnight were being registered, creating increased and unwanted competition for longstanding hawkers. The Mumbai Hawkers’ Union has since planned to conduct its own survey. Before creating new spaces for vending, cities should attempt to repurpose existing spaces. In Mumbai, the TATA Institute of Social Sciences recommends that the government allow street vendors along the elevated walkways, called skywalks, which lead to the suburban railway stations. This could help vendors and attract more pedestrians to other commercial activity on the skywalks. The TATA Institute also recommends the use of space under “flyovers” (overpasses) for hawking. Street design and zoning policies can also create space for vending areas. The inclusion of distinct “multi-utility zones” in sidewalks creates built-in space for vending (and for other useful amenities like street trees or signage). A new policy in Jakarta also requires real estate developers to set aside 5% of their space for street vending activity. Proper implementation of these spaces is key, however, as they will only be useful to vendors if they enable access to customers. Finally, cities can upgrade infrastructure to assist hawkers and create better functioning and more aesthetically pleasing urban environments. Pedestrianization of market streets, for example, can create space for vending while simultaneously mitigating the negative effects that street vendors’ use of space has on traffic flow. Constructing high-quality stalls, lockers, and common roofs over street vendor areas increases hawkers’ legitimacy and eliminates the need to transport their wares to and from home each day. Additionally, increasing the availability of proper sanitation and drainage can help improve vendors’ public image and counteract their reputation as dirty and unhygienic. For example, installing clean public toilets, trash receptacles, and improving vendors’ access to electricity and water would benefit hawkers and anyone else using those public spaces. 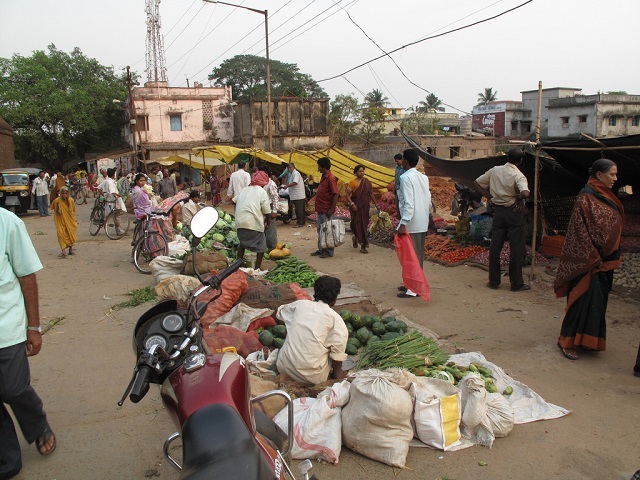 Evidence from Bhubaneshwar, India shows that proper mapping, efficient use of space, and infrastructure improvements can significantly benefit vendors’ livelihoods. A vendor engagement process in Bhubaneshwar created a series of vending zones through a participatory mapping process. The city then built fixed kiosks in these zones. Vendors have benefited greatly, with 67% reporting an increase in the number of customers and 61% reporting increased sales. Of vendors who reported increased sales, more than 70% reported increases of at least 10%. Bhubaneshwar’s creation of vending zones shows the importance of inclusive planning to support street vendors. Photo by Daniel Roy/Flickr. Vendors’ economic well-being is delicate, and policy changes should be undertaken with caution. Any relocation effort or move towards formalization must be context-specific, in consultation with vendors, and transparent in its motives and methodology. For example, when possible, infrastructure should be created where street vendors have already demonstrated their desire to sell their goods. A number of policy shifts have the potential to benefit the world’s large street vendor population; these represent just a few. However, coupled with social assistance programs and engagement with vendors, these concrete changes have the potential to substantially improve lives for the millions of vendors in cities worldwide.